I mixed up the letters (instead of putting them in abc order) to make it more challenging. B lost interest about half way through and I’m wondering if it would have been better to have them in order and to not have them so scattered on the page. This activity was inspired by Crunchy and Green. 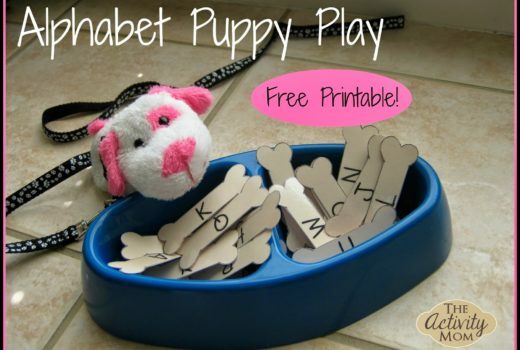 Make sure to check out her version of this activity (matching upper and lowercase letters)! hmmm, maybe less letters? 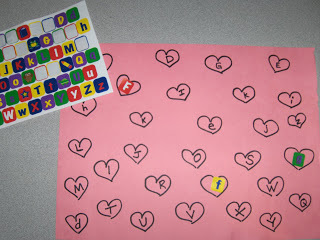 or letters that spell a message or a favorite word? i will definitely try this–as i love to use up stickers! hee hee, I have the same sticker sheet. I’ll agree with everyone else, less letters. Mine still get overwhelmed if I try to do the whole alphabet at once. Thanks! This is a great idea! …and I love your previous post – I’m going to check out those budget friendly ones because I’m all about being frugal – thanks! What a good idea, I’ll have to do that one myself. My 4 yr old is trying so hard to write her name at the moment. I too feel that its a really nice mix and match exercise for kids. I loved the idea! I will definitely put it into practice in my kinder classes! I love this. I’m going to do it with shamrocks! We just did this. Thanks for the idea!